As fascinating and informative as the Executive Education courses at EICES are, being able to see, touch, and smell Dr. James Cervino’s and the Coastal Preservation Network’s efforts at the MacNeil Park Wetlands Restoration Research Project located in College Point, Queens, New York inspired the students in the course in a profound way. Being on the water brought it all together in a vivid way. Dr. Cervino showed us how Biorock technology, which was developed in 1976, uses solar panels to create a low-voltage direct current which electrically charges submerged metal frames to generate net alkalinity (counteracting acidification and the rust process), thus building hard white limestone minerals around the metal. The process involves creating an ecologically-significant reef infrastructure where corals, mussels, oysters, and other inhabitants of healthy reefs and salt marshes can flourish. 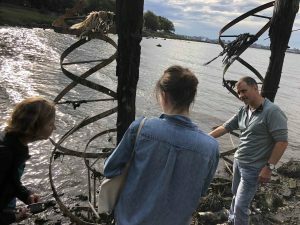 Both the art and science of Dr. Cervino’s project in New York, adjacent to a remediated Superfund waste site, speak to us: the elegant double helix shape of the metal Biorock structure covered in calcification, the tight growth of salt marsh grass (Spartina alterniflora), amongst which mussels and oysters thrive and symbiotically hold together the mass of seagrass. These MacNeil Park Biorock habitats have withstood storms for 10 years. Nearby control sites, which have not used Biorock, have not fared well. 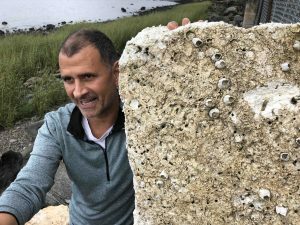 The reason is surprisingly simple: Dr. Cervino’s project improves the calcification (shell accretion) through low voltage electrical charge and creating calcium carbonate, allowing the shellfish to grow stronger shells than shellfish in the surrounding water outside of the reef structure. The electrolysis also appears to improve immunity in seagrasses and stress resistance in all of the marine species within the experimental area. Projects such as the MacNeil Park Restoration Project provide a number of diverse ecosystem services. By providing a breakwater, the revitalized wetland ecosystem protects the shore and houses built on the water’s edge that otherwise might collapse into the water with storm erosion. With increasingly intense and frequent storms and associated water surges, this service is critical. The proliferation of plant life and mollusks attract waterfowl, adding to the visual beauty of the area and enhancing recreational opportunities. People now come to the site to kayak and fish. Eventually, Dr. Cervino hopes to harvest mussels and oysters for human consumption. Even successes such as this continue to be threatened by short-term, uninformed decisions made by local and state officials. At Coastal Preservation Network’s site in College Point, new storm water pipes were installed at the top of the beach, delivering lawn chemicals, oils from street surfaces, de-icing chemicals, debris, and other pollutants harmful to the wetlands and to an area protected by the New York State Department of Environmental Conservation and New York State Parks Recreation and Historic Preservation for restoration purposes. The project is in jeopardy. A storm water pipe that would carry the chemicals and debris further out into the water another few hundred feet would go far to protect this important habitat. There is hope in that Dr. Cervino’s and his mentor’s, Dr. Thomas Goreau of the Global Coral Reef Alliance, work is being replicated across the globe in Louisiana, Mexico, Grenada, St. Barts, Grand Turk, Curacao, Bali, and many other locations throughout the Global Coral Reef Alliance network. Videos from these sites show promising before and after footage of rebuilt, renewed salt marshes and reefs and beach growth utilizing Biorock technology. Prolific growth of corals, barnacles, oysters, mussels, seagrass, and fish habitat is documented.With the heartbreaking and devastating prospect of all of our oceans’ reefs being dead by 2050, and the resulting impact on the livelihoods of millions of people around the globe who rely on reef ecosystem services such as fishing and tourism, rapid proliferation of reefs utilizing Biorock is a beacon to all those holding hope that we can still save our planet for our children and grandchildren to play on, take sustenance from, and admire as we have been privileged to do. So, the next time you think a course is just a course: think again!